I thought I would do a Q & A because there many questions to be asked and a lot of misinformation or negated information out there. Most of the information that potential clients do not have comes from inexperience on the part of the technician or artist presenting the information in total. Many schools and classes are in every city and in every state every week of the month. These two day classes are flashy and very appealing and are backed by large companies abroad and have beautiful advertising. There are many levels of artists as a result. Most veteran artists will tell you that they prefer private or small class settings to assure proper hands on time and attention to detail. If not, many do not get the hands on that is essential. Lovely certificates will not make one a great artist. It takes practice and more practice and that does not come after a 2 day class fancy or not. Question 1: Can anyone do Microblading? My friend taught her co worker… oh boy! 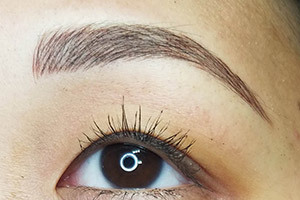 Microblading is actually a very advanced procedure that requires someone that has had experience with many clients and or has taken proper training. This helps them assess clients and their skin, previous tattoos, shape or asymmetry, lack of hair and many other things that they have dealt with many times. Many people come out of short classes and they do well but are just inexpereinced. Then there are those that try to self-teach and do not take formal classes and are therefore lacking in vital and important information for the safety and well being of the client. Therefore, when seeking an artist, please be sure they are certified and insured and have training and a gallery of work photos for you to peruse. They should also have a legitimate state license posted as well. Question 2: How much should I be paying for Microblading my brows? Prices vary city to city and tech to tech. I have taught girls that feel because they are opening their studio in a wealthy area that they could charge $800.00. I know from experience that if you get a good Microblade procedure, it could last 2 plus years. Some due to lifestyle and how people take care of them, may not last a year. If you are treated fairly on price and you had a great job, then odds are you will return to your initial artist, correct? Most of us reward people for returning with discounts as well. On the opposite side of the coin, buying a discounted $99 Microblade may not be the best idea either. People do not work for free and after their space rental, needles, pigments, and anesthetics they would not be making a dime. Think about the many questions you don’t know to ask like the type of pigments they use for one. P.S. please do not select according to price. Select an experienced tech that makes you feel confident about your decision. Question 3: Is Microblading painful to get done? Well, as you know, not all beauty procedures are pleasant. Have you been around anyone that had a face lift or breast augmentation or nose job? It is a week or two of swelling and pain. Microblading is nothing like that! It has some initial discomfort until the skin is opened and the additional numbing gel is added after the first pass of strokes. Honestly, Microblading should not be deep so it technically should not be painful. Some people are very sensitive and some people don’t numb well. They usually know that as they may not numb well even at the dentist. A well trained tech will stretch the skin taught which alleviates discomfort as well. I will say it is totally worth any small amount of discomfort it may bring. In my experience, most people do very well and handle it comfortably. Question 4: What if I don’t like the result? I have unfortunately seen many Microblades come into my office because they do not like their result. The most common thing they answer when I ask about their experience is that they never chose their pigment color, they never saw their brows until they were done and they didn’t ask for them to be dark or as big as they were. They state they were drawn lying down and their hair strokes stick straight up and the fronts are boxed off. But it was too late. Again, it’s all about doing homework and knowing what to expect and having a say and choices. Having a hand mirror nearby to look at the progression as you go should be acceptable. But if it’s already been done, it’s too late and you hate it, you have the choice of several types of removal. There are a few products to do removal or you can be referred to a laser tech for removal and, lastly you can just live with it with powder or pencil until it fades away. This is why research is the most important factor in your selection. There are options but let’s avoid it in the beginning. Yes, removal is possible. Often some tweaking is a good possibility as well. This is the best scenario. I will be back soon for some more questions and answers regarding the wonderful world of Microblading!